Hand-loading your own rifle and pistol ammunition is a great challenge for any gun enthusiast. It broadens your choices and allows you to customize your ammunition to your needs and your type of shooting. Most people who load their own ammunition save money by picking up and cleaning empty casings (brass) from a range. If you are loading for high quality accuracy shooting, purchasing new brass from a store is recommended, and these steps can be skipped. 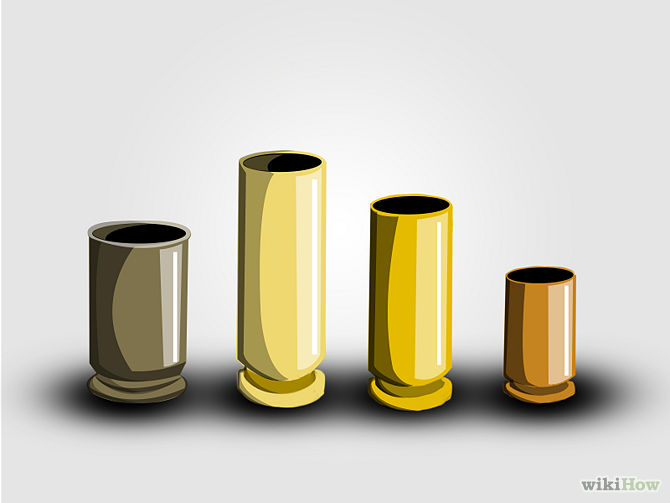 1 Pick up empty casings from where you shoot or from a gun range which allows you to collect brass. You want to pick up the cleanest brass possible (though it isn’t terribly important), but the main issues when picking up brass is collecting the correct caliber, making sure the brass is in good shape (literally), and it hasn’t been reloaded too many times. 2 Sort the casings, the level of sorting (before cleaning) depends on the calibers being used. Most rifle casings work just fine together. Common pistol calibers are a bit more picky as casings will wedge themselves in the openings of other larger caliber casings. .45s and 9mm work just fine with each other, but adding .40s into the mix will create problems. When cleaning .45s, .44 Magnums, .40s, 9mm, .357 Magnums, and 38 Specials all at the same time, clean the .45s, .44 Magnums, and 9mm in one batch, and the .40s, .357 Magnums, and 38 Specials in a separate one. You can test to see if casings work well together by trying to fit one casing into another, if it is even remotely tight it won’t work. 3 Clean the casings. The easiest way is to use a vibratory case cleaner. The case cleaner uses a media to clean the case, and optionally you can use a polishing additive to make the casings look almost as good as new! 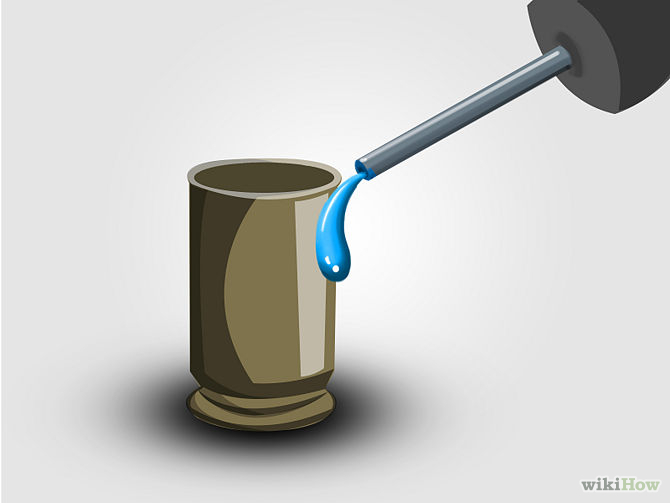 The media is usually ground corn cob or walnut hull, but liquid media is also available. The media is what makes the tight fitting cases stick in each other. When the media is not able to cycle (because it is jammed in a casing) it cannot clean as well. Note that the media is reusable, and less polish is needed every time you use the same media. Depending on how dirty the brass is, one batch of media may last anywhere between three and eight cleanings. 4 Sort the casings into separate calibers. This allows for easy access when loading so you don’t have to pick up handfuls of random casings to find the one you want. It will speed up the process in the long run. Usually you place each different caliber into separate bags for transportability or storage. 1 Collect your supplies. You will need casings, primers, bullets and powder to make a working cartridge. Dirty casings will need cleaning before use. A vibratory cleaner with corn or walnut media works great. Adding a casing polish will make your brass look almost as good as new! Set the dies on the press according to the press’ manual and the instructions that come with the dies. Each set of dies will have a somewhat unique way to set them correctly. Calibrate them to specifications of a respected loading handbook. Crimp diameters and bullet seat depths are very important for your safety (more on this later). 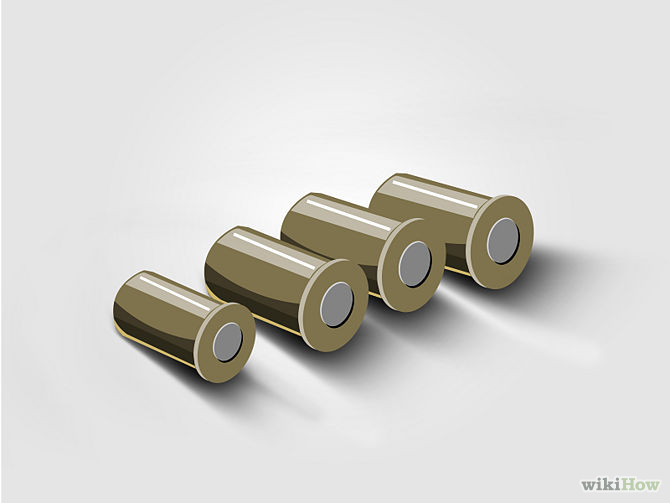 If available for the specific caliber you are loading, purchase carbide dies. 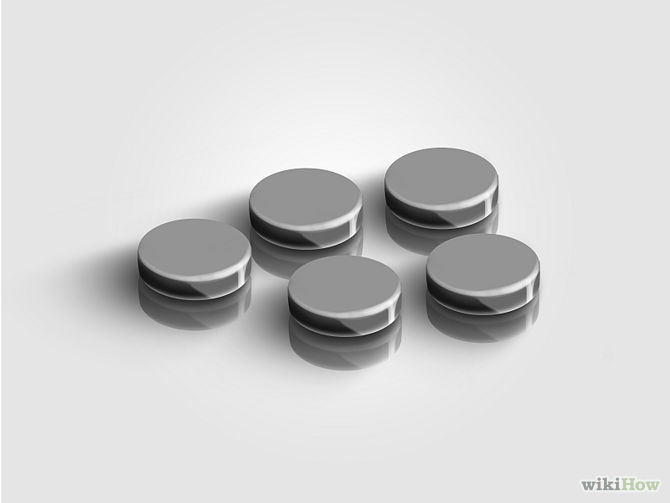 This is an especially dense type of metal which removes the need for lubricating the casings. 3 Add your selection of powder to the powder measure. Powder is very specific. Having the incorrect type of powder or an incorrect amount of powder can have very bad results. It is recommended you buy a respected loading handbook with the calibers you intend to load and follow their suggested powders and amounts. 4 Calibrate the amount of powder going into the casing by placing an empty casing below the powder measure and pulling the press’ handle. Check the amount of powder deposited in a separate scale. Most loading handbooks have a minimum, maximum, and recommended starting. When calibrating the powder measure toward the minimum or maximum, always err toward the recommended. 5 Add primers to the primer hopper. This usually involves some type of primer pickup device (often a long tube with plastic on either end and a pin). Be sure the primers are oriented correctly in the hopper. There are a few different types of primers, be sure you have the right kind: small and large pistol primers, small and large pistol magnum primers, small and large rifle primers, and small and large magnum rifle primers. The simplest way to get the right primer is to consult a loading handbook, they will have the size and type of primer, and may even have they exact primer brand/model number that they used for testing. 6 Lubricate the exterior of the casings. If you are reloading necked-down cartridges, lubricate the interior of the neck as well.Be sure to use a lubrication specifically designed for ammunition casings. This step can be skipped if you have carbide dies (carbide is much more available for pistol calibers than rifle calibers). For the sake of simplicity, this article will outline the use of a four-station (progressive) press with a powder measure (powder drop), and the use of a 3-die set. Variation 1 involves a press which does not bell the casing on the second stage (where the powder measure is). Place a casing into the first station. Often there is a spring that holds the casing in place. Be sure the casing is perfectly upright and centered. If the casing is partially crushed, it may not work, but if it makes it past the first station, it should be fine. Be sure that the casing has solid integrity, and the mouth of the casing (the opening) does not have any folds which will create operation or safety problems when fired. Pull the load press’ handle all the way down until it stops, there may be a good deal of pressure which needs to be applied. Bring the handle all the way back up to the resting position. To load a fresh primer from your primer hopper press the handle forward until it stops (this won’t be very far, but again, some pressure will be needed). Rotate the tray one station, the tray should click into position. From now on you will repeat steps 1 – 3 (a four-station press does up to four things every time you pull —or push— the handle) to keep the tray as full as possible (until supplies or time run out). The second station adds powder from the powder measure (powder drop) into the casing. 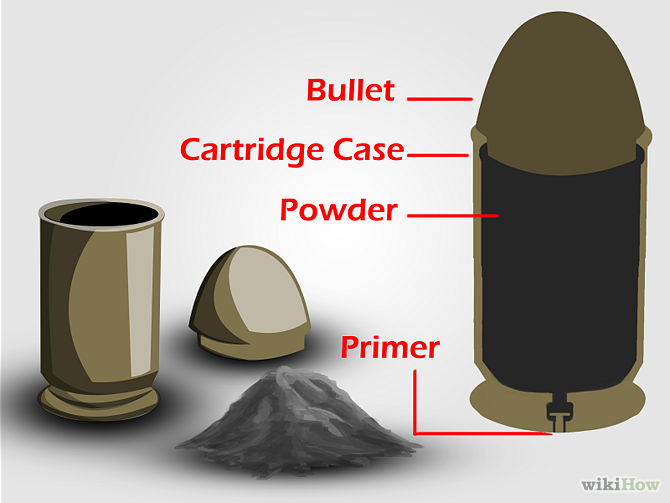 The amount of powder should be checked for the first two casings, the last casing, and every 50 – 100 casings. 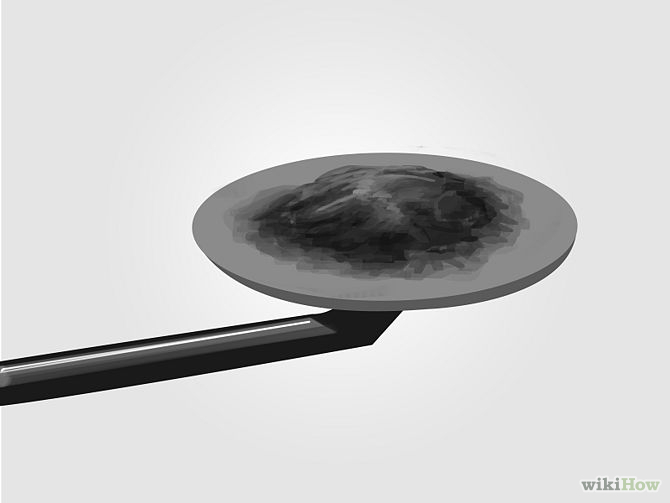 The powder measure should be adjusted if the amount of powder moves out of your predetermined tolerance range. The third station bells the casing. This allows you to easily place a bullet on top of the casing, but a bell that is any larger than needed will reduce the casings integrity, too little belling will make seating the bullet difficult. Repeat steps 1 – 3. In the fourth station, a bullet will be seated and the casing crimped. Place a bullet in the upright position on top of the belled casing. This station will also crimp the casing around the bullet. Other than the amount of powder, bullet seating depth and crimping is arguably the most important part of the loading process. A bullet which is seated too deep or a crimp which is too tight can create unsafe pressures in the chamber when fired. A bullet which is seated too shallow may cause the bullet to engage in the rifling when chambered, before it should be. This can cause inaccuracies if fired, but it can also cause a Type-4 malfunction or problems ejecting the live cartridge. 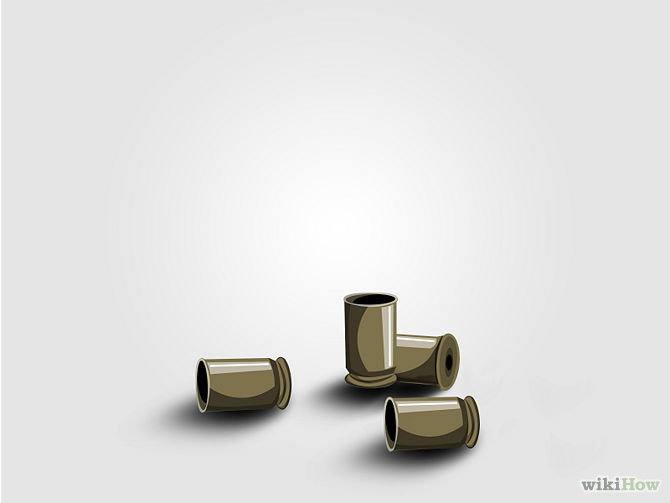 A casing which is inadequately crimped may cause the bullet to be loose in the casing, and it may potentially fall out. It can also cause the cartridge not to load into the chamber of the firearm smoothly. See tips for more information. Repeat steps 1 – 3 and add step 7 until you run out of casings, powder, primers, or bullets. Variation 2 involves a press which bells the casing on the second stage (the powder measure) as part of a caliber-specific conversion kit. Presses made by Dillon Precision and other companies use this method. The second station adds powder from the powder measure (powder drop) into the casing. The press will also bell the casing on this stage. The amount of powder should be checked for the first two casings, the last casing, and every 50 – 100 casings. The powder measure should be adjusted if the amount of powder moves out of your predetermined tolerance range. The belling should be enough to easily rest the bullet on top, but not any larger. A bell that is too large can weaken your case significantly. Repeat steps 1 – 3. The third station is where you seat the bullet. Place a bullet in the upright position on top of the belled casing. This station (depending on your dies) may also crimp the casing around the bullet. Other than the amount of powder, bullet seating depth and crimping is arguably the most important part of the loading process. 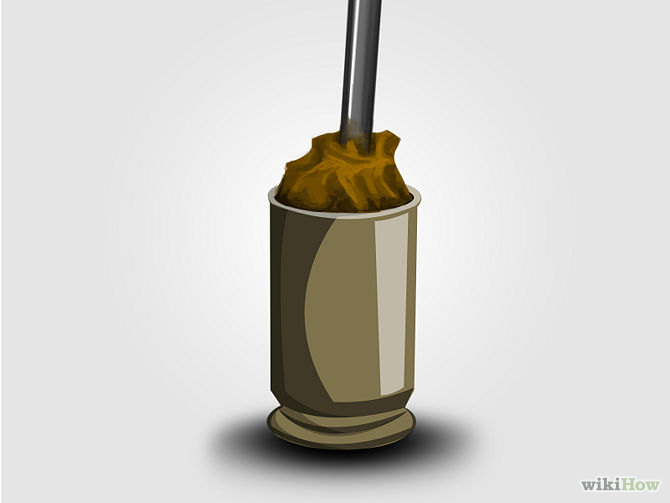 A bullet which is seated too shallow may cause the bullet to engage in the rifling when chambered before it should be. This can cause inaccuracies if fired, but it can also cause a Type-4 malfunction or problems ejecting the live cartridge. Repeat steps 1 – 3. The fourth station (depending on your dies may be empty or have a crimping die). If the fourth station is a crimping die, be sure to setup the crimp die correctly (view warnings above). Having a separate bullet seating and crimping die is highly recommended as insufficient crimping or case crushing may occur from incorrectly setup “combo-die”. Repeat steps 1 – 3 and add step 6 until you run out of casings, powder, primers, or bullets. To speed things up, have a friend pick up primers and put them in the primer hopper while you load. Also have the friend mark the bullets. Keeping you supplied may add another hundred or so cartridges to be loaded in an hour. To keep track of how many times a casing has been used, you should draw a line on your casing with a permanent marker after you load them. When you come across a casing with too many lines on it, remove it from the reloading line. IF YOU DO THIS, MAKE SURE YOU DO NOT USE A MARKER THAT HAS AMMONIA IN ITS FORMULATION. THIS WEAKENS BRASS AND COULD CAUSE A CRACK. IF IT SMELLS STRONG, DO NOT USE! Many loading handbooks have all the information you will need to correctly load a specific caliber. Often there are overall length measurements for different types of bullets, crimp diameters, chamber pressures, velocities, and even certain quirks or problems that a specific caliber may have when loading. If you are the only contributor to your brass, you will need to cycle in manufactured ammunition into the mix periodically to replace the casings which get more reloads. When calibrating the seating of the bullet and crimping of the casing a caliper (or micrometer) is a very useful tool. Loading handbooks will likely give sizes for specific parts of a cartridge. Follow the handbook as closely as possible. 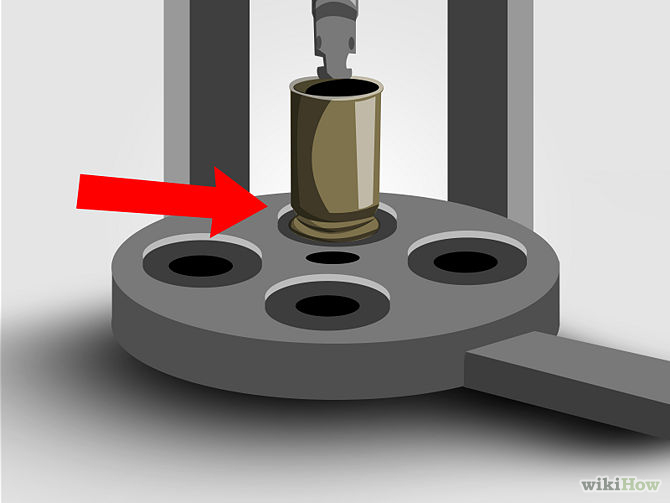 A correct initial adjustment will allow you to produce many worry free and safe cartridges. Casings can be reloaded until they begin to show signs of wear, such as a minute crack near the case mouth. Immediately discard all cases that have a bulge near the base. Another handy tool is the case gauge. 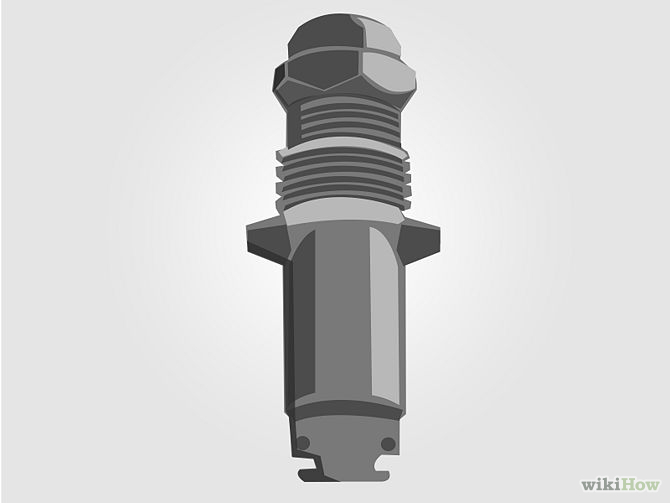 It is sort of a quick-and-dirty method to measuring a cartridge’s fit into a standard chamber. It is very important to test a cartridge with your die settings for rimless calibers as excessive crimping can cause the casing to slip past the chamber’s rim and into the rifling (bottlenecked and rimmed calibers both have multiple edges to prevent such a problem, thus it is less important). A real chamber (on your firearm) or a case gauge are both ways to test this, but a case gauge is safer, easier to transport, and less likely to get a cartridge stuck into your firearm. Most loading presses will advertise a much faster reloading rate than possible. With a standard multi-station press, an average person could load 200 – 300 rounds per hour which includes picking up primers and checking powder levels in the hopper and casings periodically. Over-crimping or seating a bullet too deep can also cause excessive chamber pressures and cause the casing or gun to blow out or blow up (respectively). While reloading you should always wear eye protection for your safety. 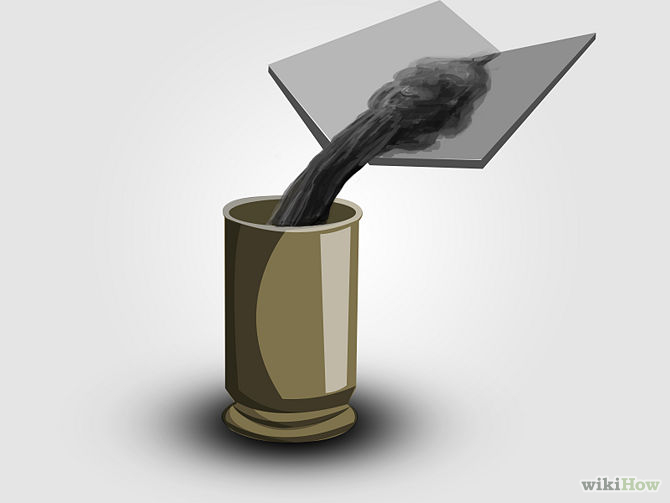 Gun powder and primers are very flammable and susceptible to ignition. Keep them stored in a safe location away from heat sources and other sources of ignition. Loading a cartridge with more or less than the recommended amount of powder can be very dangerous. While revolvers and bolt-action rifles are more forgiving when it comes to excessive powder loads, all casings are able to blow out and all guns are susceptible to kB!ing (exploding). Never, under any circumstances, extract a live primer from a casing, it may ignite the primer which can be dangerous. Always load in a well ventilated area as inhalation of gun powder dust or lead can cause serious medical problems. Pregnant women, or women who may become pregnant should not handle partially jacketed bullets, as lead is known to cause birth defects. Always wash your hands and any surfaces which have contacted the bullets after a loading session; lead can be poisonous or cause birth defects. “Total metal jacket” (TMJ) bullets are available which reduce the likelihood of contact with lead. Previous PostWhat NOT to Wear When Bugging Out After a Disaster! Next PostSurviving SHTF With A Glock Pistol?